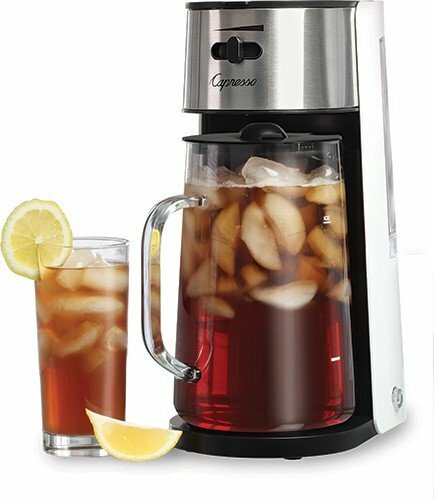 Thermal Carafe Coffee Maker with Grinder. 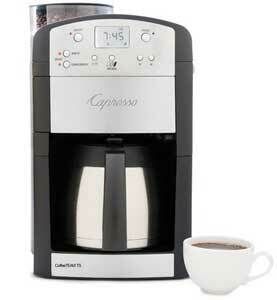 The Capresso CoffeeTeam TS is a programmable 10-cup coffee maker. It features a stainless steel thermal serving carafe and a built in conical burr grinder. Programmable Clock/Timer – Wake up to a full pot of coffee. Slow burr grinding imparts minimal heat, preserving more aroma than blade grinders. Offers five coffee grinds fineness settinTS for light to dark beans; five-cup size settinTS and three strength settinTS. Unlike other grind and brew coffee makers, the Capresso Coffee Team TS separates the grinder and brewer keeping moisture away from the grinder. Just before brewing, the grinder is automatically sealed off to keep steam and moisture away from the conical burrs. Charcoal Water Filtration System removes chlorine and other impurities, one filter included. Automatic indicator for when to replace water filter.